Is AAMCAR Cheaper Than UBER? Anyone who’s been to New York knows that every corner of the city has something new and exciting. Many people who visit New York believe that driving is not an option, and that New Yorkers only public transit or taxi. This may have been true in the past, but this is simply no longer. For a cheaper alternative to Uber and a more convenient and personal alternative to the subway, use AAMCAR, a car rental company. It is affordable, without any hidden costs. Most car companies look affordable on the surface. That is until they slap you with hidden costs non included in the original quote. But with AAMCAR, what you see is what you pay. With car sharing services such as Uber and Lyft sweeping the nation, it is easy to see how and why Americans are conflicted on how to get around. However, with AAMCAR, there is no question. Have the convenience of your own car to chauffeur you and your companions around on your own time to your own destination. Or use AAMCAR to move! One of the first determining factors for weighing your cost savings for using Uber vs rental cars is considering the length of your stay. 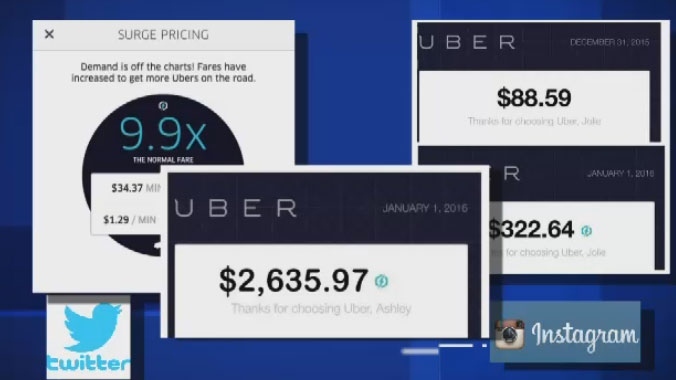 Is Uber cheaper than a taxi or renting a car? Do the math! Economy rental cars will typically cost between $45-65 per day and should fit two adults and two children. With these numbers in mind, you can expect to drop between $315-450 for a seven day trip. Uber’s rates are going to be calculated by your mileage in motion, meaning if you just need a quick lift over a short distance, it’s a cost-efficient choice. To put it into perspective, a 30 minute drive might not seem like much, but that 20 mile each way could end up costing you $40-50 there and back with a ride hailing service. If you times that by the number of days you’re staying to get your “per day Uber cost,” you might be better off just signing up for the rental. Then there’s considering those extra charges. Do you have to tip your Uber driver? That’s like asking if you have to tip a waitress. Technically, no, but it’s always a nice gesture as a thank you if your driver was accommodating and friendly. Consider that when renting you still need to pay for gas as well as parking fees as well for wherever you visit. If the place you’re staying has free parking, that’s a plus, but you could always have to pay to park in a garage or have to deal with the fuss of going back to the car to feed a meter if you are parking in the city on your trip. If you’re on vacation with your family too, consider how many passengers a ride hailer’s vehicle could hold verses a rental car. Does Uber charge per person? The answer is no, however, depending on the kind of car service you go with, the number of passengers varies. For example UberBLACK cars have a four person passenger limit. If you have a full squad, renting a minivan might be the most convenient. Keep an eye out for hidden rental car fees though as well, such as extra for returning the car to a different location, adding an additional driver, being under the age of 25, or going over your allotted miles. There are a large range of vehicles offered by AAMCAR, depending on your needs and specifications. AAMCAR’s vehicle rentals include economy, compact, full size, mid-sized, minivans, cargo vans, SUVs, and moving vans. If one is more specifically interested in the car’s make, AAMCAR offers the Nissan Cube, Ford Mustang, Ford Explorer, and so many more. If you are travelling with a large party, AAMCAR is proud to offer a 15 Passenger Van so that everyone can participate and no one gets left behind. This 15 Passenger Van Rental is one of AAMCAR’s most popular options and is most often used for large parties, large families, and everything in between. AAMCAR also offers luxury cars to make your getaway even more special. AAMCAR is proud to offer certain services to enhance the rental experience. Conveniently located on the upper west side, AAMCAR offers late drop off hours, late model sedans, accepts debit cards, most foreign licenses, and also speaks Spanish. Nobody wants to be stranded without any means to get around, pay high Uber prices, or be stuck on the ever unreliable public transit system. There is only one answer: AAMCAR Car Rentals. The Apple Tree is a series of three musical plays which you can see with your Manhattan rent a car. The three plays each have their own story lines, but they are tied together by common musical themes and references. For example, the color brown is used throughout. The first act of the play is based on Mark Twain’s The Diary of Adam and Eve; the second is based on Frank R. Stockton’s The Lady or the Tiger; and the final act is based on Jules Feiffer’s Passionella. This play was first produced on Broadway in 1966 at the Shubert Theatre and originally won a Tony Award for the best actress in a musical. Today you can see it with your Manhattan rent a car at the Roundabout Theatre Company, which is one of the largest not-for-profit theater companies in New York. The Roundabout Theatre Company is the largest non-profit theater company in New York and they own two Broadway theaters that you can visit with your Manhattan rent a car. One is Studio 54 and the other is the American Airlines Theater. They also have one Off-Broadway Theater, the Laura Pels Theater in the Harold and Miriam Steinberg Center for Arts. The Apple Tree is currently playing at Studio 54 where 110 Degrees in the Shade is also playing. 110 in the Shade is the story of a heat wave in the 1930s which you can also see at Studio 54 with your Manhattan rent a car. It follows the life of Lizzie Curry, who is on the verge of becoming an old maid. It is the middle of a heat wave in Texas and everyone is waiting for the wind and the rain to cool down. Lizzie has a secret crush on the town sheriff, who doesn’t return her love. But then one day a charismatic rainmaker comes to town, and turns her life upside down. From the same authors of The Fantasticks, it is a play about American magic realism. If you would like to come see The Apple Tree with your Manhattan rent a car, you can catch the show at the Studio 54 Theater at 8 p.m. Tuesday through Saturday or a matinee at 2 p.m. on Wednesday, Saturday, and Sunday. This show is appropriate for everyone, but children under 4 will not be allowed to attend. If you would like to eat before coming to the see the play with your Manhattan rent a car, 21 is New York’s most famous speakeasy and is just a few blocks away from the theater. They offer a prix-fixe menu which also includes the price of parking for six hours for your Manhattan rent a car. This is a great way to enjoy dinner and a show, making it a true New York experience. If you would also like to save a little money when seeing a Broadway musical, then visit Duffy Square nearby. They sell ticket for same-day shows at reduced prices – up to half off! No one knows New York like a true New Yorker thats why they invented www.AskANewYorker.com: the webs number one Big Apple information resource center! Designed to provide curious travelers with up-to-date information on anything and everything NYC, the Ask A New Yorker webpage is overflowing with friendly, firsthand advice 7 days a week and 24 hours a day! Maintained by over 12 million New Yorkers daily, the Ask A New Yorker website is Manhattans most trusted tourist network, connecting millions of travelers with top-notch editorials, outstanding reviews and informative articles. Home to an unbelievable database of city news and community information, www.AskANewYorker.com is much more than youre average vacation planning page. From shopping advice to best selling books, the Ask A New Yorker webpage has everything you need to make the most of your upcoming AAMCAR Car Rentals New York City rent-a-car vacation! So why wait?! Log on today and see why so many travelers call www.AskANewYorker.com the voice of NYC! Created to provide New Yorkers with a space to praise their beloved hometown, www.AskANewYorker.com is currently home to thousands of interesting articles and evaluations, cataloging practically every corner of the City That Never Sleeps. Designed as a virtual microcosm of the city, the Ask A New Yorker website provides travelers with a wealth of potentially priceless information capable of enhancing almost any New York City escapade. Whether youre visiting the city on business or as part of an AAMCAR Car Rentals New York City vacation, the Ask A New Yorker website is the perfect place to clarify any pre-vacation jitters or nagging New York annoyances. No question is every considered silly at www.AskANewYoker.com, so go ahead and submit yours today! Over 12 million people have shared their opinions on this prolific community website, so why not see for yourself what all the fuss is about?! Visit www.AskANewYoker.com today! From Frequently Asked Questions to useful New York State demographics, the Ask A New Yorker website has everything you need to make your upcoming AAMCAR Car Rentals New York City vacation a slam-dunk on all fronts. Equipped with an easy-search database of up-front articles and in-your-face answers, the Ask A New Yorker website has the skinny on everything from baby changing facilities to A-list restaurants. Plus the site even features an online store dedicated to providing savvy tourists with cool Big Apple swag and authentic New York City attitude! A must-visit vacation information station for just about any AAMCAR Car Rentals New York City vacationer, www.AskANewYorker.com currently features a variety of exciting editorial pieces aimed at providing travelers with an exclusive look into the lives of real New York City inhabitants. These special features include the New Yorker of the Month, UBERCHIC, Top Ten Books, and The A-List. Designed to provide travelers from around the world with useful New York City travel information, the Ask A New Yorker website currently features articles from hundreds of cosmopolitan travelers accounting for nearly 188 different nationalities and a handful of international languages. Your on-stop-spot for up-to-date, honest information will always be www.AskANewYorker.com, so why waste your vacation pondering a pointless problem? Ask the experts at AskANewYorker.com and get back to enjoying your AAMCAR Car Rentals New York City getaway! If you would like to post a question at AskANewYorker.com please feel free to log on to the expansive Question Forum. Answers are often posted within minutes, so remember to check back often for replies, advice, opinions and follow up information. AskANewYorker.com also features a variety of useful links intended to provide travelers with even more travel information, so please feel free to leave the site for further vacation guidance. AskANewYorker.com is constantly updating their resources so please remember to log on often to learn more about one of Americas most talked about business and vacation destinations! Begin your next adventure with your New York car rentals AAMCAR Discount Car Rental on a happy note. A Chorus Line is arguably one of the best Broadway musical ever created and is definitely something you shouldn’t miss when you travel with your New York car rentals. Since its first opening on July 25, 1975 at the Shubert Theatre A Chorus Line had been a long time audience favorite. In fact it held 6, 137 performances until its closing on April 28, 1990 surpassing Cats and The Phantom of the Opera for longest running American musical. A Chorus Line also came fourth for the longest running musical after The Phantom of the Opera, Cats and Les Miserables. The musical A Chorus Line is based on several taped sessions of Broadway dancers or “gypsies”. Initially when A Chorus Line was first conceived it actually consisted of eight actors/ actresses of the Original Broadway cast. Directed and choreographed by Michael Bennet, with music by Marvin Hamlisch and lyrics by Edward Kleban. The book was assembled by James Kirkwood, Jr. and Nicholas Dante. A Chorus Line had a several successful tours even making a visit to the Pantages Theatre in Hollywood. In fact, it was gaining so much esteem that it won the Laurence Olivier Award as Best Musical of the Year in 1976. Sad you missed out on one of the greatest musicals in history? You can turn that frown upside down when you travel with your New York car rentals company AAMCAR Discount Car Rentals. Lucky for you the first Broadway revival of A Chorus Line opened at the Gerald Schoenfeld Theatre on October 5, 2006. Featuring 19 main characters in a Broadway Theater auditioning for a part in the chorus line of a musical, the audience gets a glimpse of the personality of each individual performer. Each performer and the choreographer describe the events that shaped their lives and how they became to be what they are today. The songs you hear when with your New York car rentals company AAMCAR Discount Car Rentals will be some of the best you have heard in Broadway with honorable mention to “One”, “Nothing”, “Dance: Ten; Looks: Three,” “The Music and the Mirror” and “What I Did For Love”. No trip to New York is complete without seeing a Broadway musical with your New York car rentals company AAMCAR Discount Car Rentals. It’s easy to have a fun time in New York when you travel with your New York car rentals company AAMCAR Discount Car Rentals. Here is some more useful information that you might need to know to help plan your trip. Performances of A Chorus Line are held on Tuesday – Saturday at 8:00 pm, Wednesday and Saturday at 2:00 pm, and Sunday at 3:00 pm. Book early, 2 to 3 months to be exact if you want to get the seats you want. Traveling with your New York car rentals company AAMCAR Discount Car Rentals with a group of 12 or more people? Inquire about a special discount rate online on their official website. Beat the lineup and order your tickets in the comfort of your own home. You can buy tickets online by clicking here. 236 West 45th Street between 7th and 8th Ave.
On the edges of Brooklyn’s Prospect Park you’ll find a fairytale world of Victorian opulence and extravagance, complete with a Renaissance-style palace. This stunning display of cosmopolitan wealth may seem out of place in the Prospect Park of today, but AAMCAR New York Car Rentals encourages you to try and image the park as it was more than 100 years ago. The late 1800’s were a time of glamour and excess in the prosperous city of Brooklyn, providing residents an opportunity to manifest their aristocratic status in works of art, as well as architecture. When viewed in this manner Grand Prospect Park doesn’t seem all that out of place. Located for more than a century on Brooklyn’s historic Park Slope, Grand Prospect Hall now functions as one of New York City’s grandest events facility. Designed for extraordinary parties, Grand Prospect Hall features an immaculate dcor reminiscent of France’s famous Palace of Versailles. Customers of AAMCAR New York Car Rentals are invited to add a little pomp and circumstance to their upcoming vacation by spending some time inside this splendid facility. Whether you’re planning a party or simply visiting the area, Grand Prospect Hall is sure to set your imagination flying. When local entrepreneur John Kolle built Grand Prospect Hall he did it in order to create a “temple of music and entertainment”. Supported by local politicians, businessmen and masons, the building was designed to function as Brooklyn’s social, cultural and political mecca. Money was never a question during the hall’s creation. Kolle’s inspiration was none other than the lavish French court of Versailles; he wished to recreate this palatial French palace in its entirety- including all 140,000 square feet and four magnificent stories. Kolle hired talented architect Ulrich J. Huberty and the rest is history. Huberty’s vision resulted in ornate marble and granite lobbies; rich oak and mahogany paneling; stained glass artistry; and dazzling crystal chandeliers. Grand Hall also boasted a number of firsts, including the first “French birdcage” elevator, the highest rooftop garden and the first electrified commercial building in all of Brooklyn. Since opening at the turn of the 19th century, Grand Prospect Hall has functioned as a place for the prominent to parade, celebrate and party, so what’s holding you back? Customers of AAMCAR New York Car Rentals can still ride in the Otis French birdcage elevator today, so remember to stop by and see it for yourself during your upcoming NYC vacation. If you’re planning an exciting party during your upcoming visit to NYC, there’s only one hall grand enough to reserve. Grand Prospect Hall currently functions as New York’s finest event destination, providing customers of AAMCAR New York Car Rentals with access to some of the city’s finest amenities. From weddings and dinner parties to business meetings and charity galas, Grand Prospect Hall has everything you need to make your upcoming celebration sensational. From the stunning ballroom to the beautiful garden grounds, Grand Prospect Hall provides customers of AAMCAR New York Car Rentals with a flexible event facility perfect for most any occasion. Over the years, Grand Prospect Hall has hosted everything from Hollywood parties to meetings between international leaders, proving its status as an international event establishment. No other facility in New York City provides customers with the same regality as Grand Prospect Hall, so why bother planning your party anywhere? Contact a party planner at Grand Prospect Hall today and prepare for the event of a lifetime. Does your upcoming event require a little grandeur? Then now’s definitely the right time to contact Grand Prospect Hall. To learn more about available amenities at Grand Prospect Hall please feel free to contact a hall representative directly at 1-718-788-0777. Customers of AAMCAR New York Car Rentals can also visit the official Grand Prospect Hall website at www.grandprospecthall.com. Grand Prospect Hall is located at 263 Prospect Avenue in Brooklyn, NYC. Rent is a very popular play on Broadway. As a Tony Award- and Pulitzer-winning rock musical that has been turned into a hit movie, it is a great play to see with your car rental in New York. The story is based on the opera, La boheme, but it is set in the 1990s in New York’s Alphabet City with the threat of AIDS. Rent is an interesting play to see with your car rental in New York because it was one of the first plays to feature gay, bisexual, lesbian, an transgender characters who faced many challenges: drugs and AIDS were prominent during this period. The play is also noted for its ethnically diverse cast, with many leading roles. This is not a play for younger children: there are references to these taboo topics. But teenagers and adults will enjoy it. Many critics have pointed out that this play appeals to Generation X the same way Hairspray appealed to those who grew up in the 1960s because of all the cultural references in the play. How do you measure a play? The idea for the play came from Puccini’s La Boheme, but the old world was replaced with the noisy New York City setting. There are many similarities between the two stories. There is a disease that is prevalent in the community (tuberculosis for the opera, HIV/AIDS for the play). There are also the creative people on the outskirts of society. In the opera it is the poets, artists, and musicians. In the play you have the filmmakers, musicians, and performance artists. As you may learn before you go see the play with your car rental in New York, a lot of the elements within the play are taken from the writer’s own life. He was also a struggling artist ho lived in New York in poor conditions for his art. He had used illegal wood-burning stoves and dealt with broken buzzers on a regular basis. The story itself follows the lives of eight friends in New York as they struggle with everyday life. They face problems such as relationships, love, loss, the reason for living, housing, and of course, AIDS. When you come with your car rental in New York, you will meet Mark, who is a documentary filmmaker who chronicles the people in the story. There is Mark’s roommate Roger, who is an HIV-positive musician recovering from a heroin addiction. He falls in love with Mimi, who is also infected with HIV. She dances in a club and is addicted to heroin. There is Benny, the ex-roommate who married a wealthy girl and got out of the neighborhood. He is now the landlord. Most characters consider him to be a sellout. Then there is Maureen, who is a performance artist. She was Mark’s girlfriend, but then fell in love with Joanne. There is Angel, a drag queen and musician with AIDS. Angel falls in love with Tom, a professor and anarchist with AIDS. All of the characters know and interact with each other throughout the play. When you come see Rent with your car rental in New York, you will be taken into a world you may never have realized existed or it may be one that you see every day. What is so appealing about this musical is the humanity of the characters. You can feel their pain and, although you may not agree with what they do, you can empathize with making a bad decision that has lead you down the wrong path. This is one of the best plays on Broadway. Get ready for a whole lot of laughter when you travel with your New York car rentals company AAMCAR Discount Car Rentals. When on your trip to New York a definite stop must be made to Broadway, no trip to New York is complete without it! Watch one of the most popular Broadway musicals with your New York car rentals company AAMCAR Discount Car Rentals. Monty Python’s Spamalot is a comedic musical that will have you roaring with laughter. Based on the 1975 film Monty Python and the Holy Grail it is a parody of Arthurian Legend. However, the Monty Python musical differs in several ways with the original film, especially its parodies of Broadway theatre. It has gained a lot of popularity since its debut on March 17, 2005 and has even won the Tony Award for Best Musical of the 2004 to 2005 season. So begin your adventure today and let your New York car rentals AAMCAR Discount Car Rentals take you there! Monty Python’s Spamalot on Broadway follows King Author on his search for the Holy Grail. On his travels accompanied by his servant Pantsy, King Arthur recruits several knights including Sir Bedevere, Sir Robin, Sir Lancelot, and Sir Galahad. On the journey together, the group comes across an assortment of characters including Prince Herbert, The French Taunter, Tim the Enchanter, Not Dead Fred, the Black Knight, and the Knights who say Ni. When you come and watch the Monty Python’s Spamalot with your New York car rentals company AAMCAR Discount Car Rentals you will find that the typical portrayal of the regal king and brave knights will not be found here. Instead King Author, the King of Britons has great difficulty to counting to three, Sir Lancelot is portrayed as a psychopathic knight, Sir Robin is useless as a knight but well versed in musical theatre, Galahad is dashingly handsome and a former political peasant, Sir Bedevere although wise has a horrible odor, and even more hilarious portrayals can be found when you travel with your New York car rentals. When you watch the Monty Python’s Spamalot with your New York car rentals company AAMCAR Discount Car Rentals you may notice that some of the faces on different characters seem familiar. Don’t worry, your eyes do not deceive you. In tribute to the film, the Broadway musical does cast doubling. Cast doubling is where several actors play multiple roles. The only major characters that are not doubling are King Arthur and the Lady of the Lake. The musical’s book and lyrics was written by a member of the original Monty Python team, Eric Idle. Idle also collaborated with John Du Prez on the music. Visit one of the world’s best performing arts conservatories in the world with your New York car rentals company AAMCAR Discount Car Rental. Known more informally as Julliard, it was established in 1905 and has had many famous alumni graduate from the school and succeed in the fields of drama, dance, and music. Julliard is currently located in the Lincoln Center, the school trains over 800 undergraduates and graduate students. So come and visit this famous arts school with your New York car rentals company AAMCAR Discount Car Rental. Founded in 1905 the Julliard School was originally called the Institute of Musical Art and was located at Fifth Avenue and 12th Street. In its first year the institution enrolled 500 students. In 1910 the institution moved to Claremont Avenue and in 1920 the Julliard Foundation was created. Named after textile merchant Augustus Julliard, he gave a substantial amount in hope to forward the advancement of music in the United States. The school eventually branched out adding divisions in dance and drama. Currently Julliard is undergoing major construction to is original 1969 building that will yield over 3900 square feet of space for classrooms, rehearsal studios, teaching studios, and offices. Also in the plans are a multi-functional performance space and a multi-use writing, and public speaking center. Not only that, the lobbies of the Julliard theatre and Alice Tully Hall will be merged creating new entrances to the venues. The renovations are expected to be complete in 2009. Visit Julliard with your New York car rentals company AAMCAR Discount Car Rental and see the amazing changes happening in Julliard. When you visit The Julliard School with your New York car rentals company AAMCAR Discount Car Rental make sure you drop by and see the Julliard’s manuscript collection. Billionaire collector and financier Bruce Kovner graciously donated a trove of precious manuscripts in 2006. Including autograph scores, sketches, composer-emended proofs, and first editions of major works by Brahms, Schumann, Schubert, Beethoven, Chopin, Stravinsky, Bach, Liszt, Ravel, Copland, Mozart, and other masters of the classical music canon, many of these manuscripts have been unavailable for generations and are just becoming available now for the public to see. Let your New York car rentals company AAMCAR Discount Car Rental take you to Julliard to see this amazing collection. Some of the highlights Juilliard manuscript collection includes the printer’s manuscript of Beethoven’s Ninth Symphony, Mozart’s autograph of the wind parts in the final scene of “The Marriage of Figaro”, and manuscripts of Brahms’ Symphony No. 2 and Piano Concerto No. 2. Come and visit Julliard today! Visit the Julliard School with your New York car rentals company AAMCAR Discount Car Rental. You can have an in-person tour of the Julliard campus by filling in the online tour reservation form by clicking here. For more information please visit Julliard’s official website at http://www.juilliard.edu. Grey gardens is a Broadway musical based on the book by Doug Wright and the 1975 documentary of the same title. It follows the lives of Edith Ewing Bouvier Beale and her daughter Edith Bouvier Beale, who were related to Jacqueline Kennedy. The first act of the musical is a speculative attempt to explain the Bouvier’s fall from grace. This is the life of Jackie O’s most outrageous relatives, so there is sure to be a lot of drama in the play. These two women were once at the top of the social ladder, but later became the most notorious recluses in East Hampton, living in their mansion. The first act goes back to 1941 when they were enjoying life and attempts to explain what happened. The second act shows what happened to these women by 1973 and the squalor they lived in. Both hilarious and heartbreaking, this is a play that you will want to see with your New York cheap car rental. Grey Gardens is playing at the Walter Kerr Theater on West 48th Street with your New York cheap car rental. This theater was built in 1921 by the Shuberts in only 60 days! It seats 975 people, and has housed other productions such as Doubt Take Me Out, The Piano Lesson, and Gem of the Ocean. The Pirate Queen is a musical based on the life of a 16th century Irish Chieftain, adventuress, and pirate named Grace O’Malley. When you come see this with your New York cheap car rental you will learn a little about Irish history. The daughter of the captain is hidden on the ship because women were at this time considered to bring bad luck to ships. The daughter, Grania, disguises herself as a boy and when disaster strikes she proves that she is just as good as the men. As Grania gets older, she falls in love with her childhood friend Tiernan and helps the clan become some of the most feared pirates in the world. The Queen of England, Elizabeth I, feels she is the queen of Ireland and will not be rivaled by another woman. Grania is ordered killed. Ireland falls into turmoil and opposition to the English grows. The death of Grania’s father raises her to the level of chieftain. Grania dismisses her husband for being a coward and goes back to Tienan. But her husband is out for revenge and betrays her. The English capture her, but Tienan escapes with her son. Tienan offers himself for Grania’s freedom. Elizabeth feels bad for Grania because she herself has faced major obstacles in her rise to power. When you see this with your New York cheap car rental you will see the confrontation between two countries and two powerful women. Seeing a play on Broadway is a great experience with your New York cheap car rental. In order to see these great plays, you might want to save a little money since they can be a little pricy. For discount tickets, you can go to Duffy Square, near Times Square. Here, there is a ticket sales office called TKTS, which sells tickets at half price for same-day shows.